Is there a better holiday than Friendsgiving? Friends, food, and let’s face it, a drink or two make this unofficial holiday one that we most look forward to every year. In honor of this festive holiday, we partnered up with Pinch Provisions to bring you some Friendsgiving survival tips! We will also be having a special Friendsgiving Survival Kit giveaway via the Paper Source Instagram account where one winner will receive some Paper Source goodies and a Pinch Provisions Friendsgiving survival kit! Check out these tips from the company that is known for making celebrations and everyday life a little easier. Thanksgiving is all about being with the ones you love and celebrating everything you’re grateful for each day. There is no better way to show these moments of gratitude than with simple and thoughtful DIY touches you can add to your Thanksgiving tables. Whether you’re hosting the holiday in your home, or venturing to another, learn how to add delightful additions to your tablescape, or personalize a thank you gift for your host/hostess. Thanksgiving is just around the corner and along with that comes Friendsgiving, a more casual gathering of friends to give thanks for each other before the family comes rolling into town. Our friend Audrey of Love Always, Audrey outdid herself in making a gorgeous spread for her Friendsgiving dinner. The season of giving thanks is here, meaning you can look forward to a festive feast with friends and family. Whether you have a fully-packed kids table or an elegant and refined theme, Paper Source is here to get you ready to give thanks in style. Get inspired by some of our favorite table sets below! Chalk it up to a good time at the kid’s table with adorable and customizable Pilgrim Place Cards and Chalkboard Table Runner! 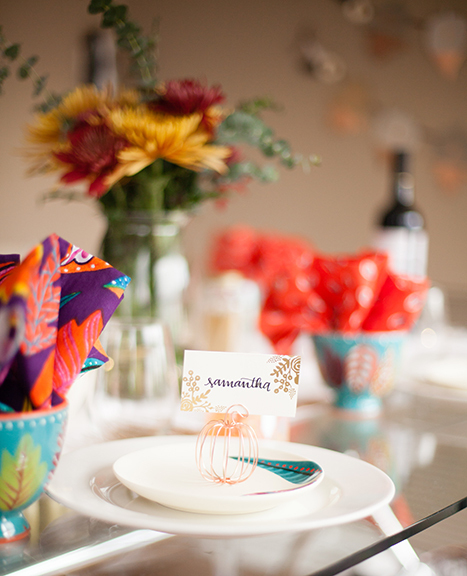 For a fun way to keep everyone occupied while waiting for seconds, let them draw on the table (runner, of course) and design their own place setting! Repurpose fine paper to build napkin rings to complete the set. In honor of Thanksgiving next week, here are some of our favorite turkey items to help you celebrate the day. You won’t believe it’s not turkey. This funny addition (it’s an Inflatable Turkey!) is so convincing you’ll have to make sure your guests don’t try to dig in. 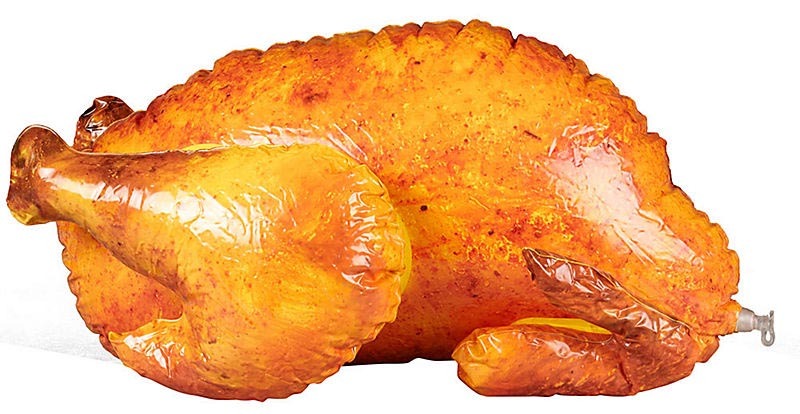 Don’t worry about cooking your turkey to perfection–you’ll have this beautiful bird on standby! 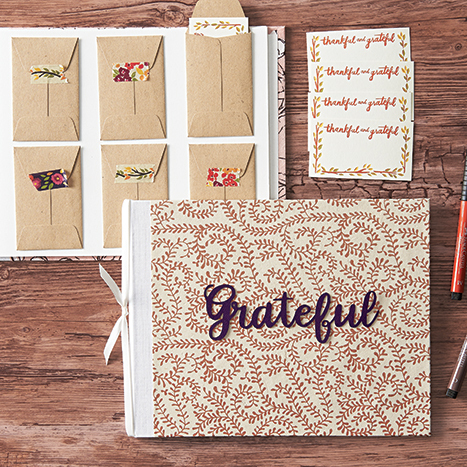 Stay grateful long past your turkey dinner with these unique journals. With the busy holiday season quickly approaching, these thoughtful books are a wonderful way to slow down and reflect on your year. Why not give the gift of gratitude? Charming designs and engaging writing prompts make these diaries a great present for yourself or a friend. Thanksgiving is coming up and we’re loving these kits! Make them with your family and friends for a fun activity to get the season of thanks started! Get these quick, while supplies last, or stop by a store! Decorate with thanks. Do you go around the Thanksgiving table and say what you’re thankful for? Add a new twist to the classic holiday tradition by having friends and family write their blessings on the leaves of this Grateful Wreath Kit. Then assemble them together and display throughout the year as a handmade reminder!